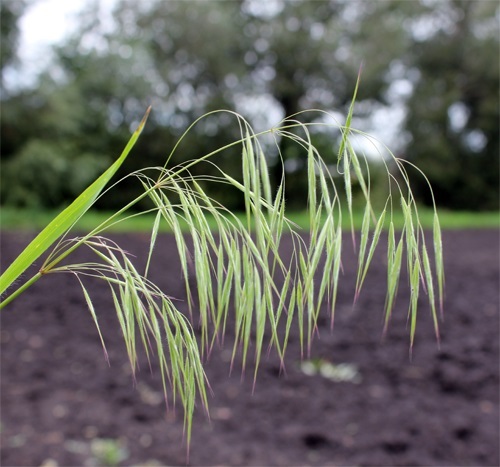 Downy brome is native to southern Europe and southwest Asia. It was introduced to North America through contaminated crop seed and ship ballasts. It was also used in reclamation seed mixes because of its ability to establish quickly in dry soil. 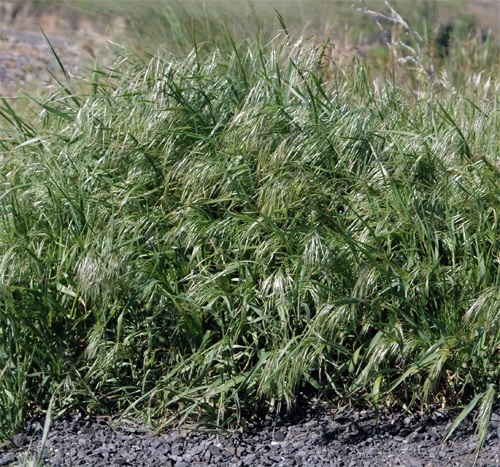 This grass species can alter the understory of oak ecosystems and invades rangeland where it is highly competitive, especially after wild fires. Downy brome is a slender annual grass that grows 10-70 cm tall. The flowers are drooping and one sided. The awns are 12-15 mm long. The first glume has one nerve. All parts of the plant usually have soft hairs, including the main stem within the seed head. The entire plant often turns purple in fall. This species is very similar to Japanese brome. Downy brome likes dry and open areas and can be found together with Medusahead, another invasive species.